The word Acolyte [ak-uh-lahyt] in its current form is from Middle English, from Anglo-French & Medieval Latin; Anglo-French, acolit, from Medieval Latin acoluthus, from Greek akolouthos. In its very basic meaning the word means a follower or attendant. 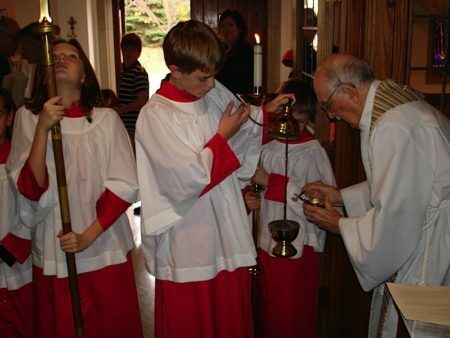 Most people know acolytes as altar boys and girls or altar servers. The Acolyte ministry has its roots in the Old Testament, where the prophet Samuel is seen assisting Eli, the Levite priest, and Elisha is seen assisting Elijah the Prophet. The first mention of acolytes was written in 251, in a letter from the Bishop of Rome to the Bishop of Antioch. The letter states that in Rome there existed at that time forty-two acolytes. These acolytes were not youths as today. Some of the liturgical duties performed by our youth today came out of the acolyte ministry of the traditions practiced in the 14th century by adults in the highest of the four minor orders (Porter, Exorcist, Lector and Acolyte), leading to the major orders (Subdeacon, Deacon, Priest and Bishop) of ordained ministry. Many of the roles of the various orders have become duties of the laity. St. Mark’s offers a rich tradition of acolyte ministry to youth starting at age 10 and up. Acolytes enhance our liturgical celebrations and provide a special level of participation for our youth. Acolytes at St. Mark’s light candles, ring the sanctus bells, and assist at the altar and credence table. They are torchbearers, crucifers and thurifers. The ministry fosters commitment, devotion, responsibility and teamwork.